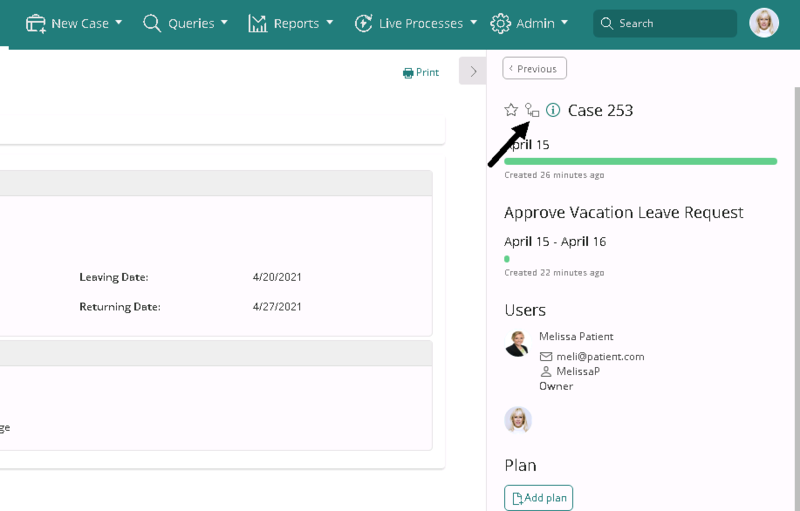 The Work Portal displays a user-friendly interface to manage pending activities. When opening a pending Activity, the associated form in the process will display its information allowing to view and enter the required information to accomplish the activity. The following sections can be found in the left side bar. 1.Overview: Shows general information about the current Activity. 2.Current Activity: Shows the Activity Form of the current Activity. 3.Case Folder: Shows information about the current Case such as Discussions, Files and its Timeline. 4.Process Path: Shows the Process path including the process' application, process' name and current Activity name. 5.Help: Opens the configured help URL for the current activity. This icon does not appear if the URL has not been configured, refer to Task Properties or Event Properties for more information. 6.Print options: Allows printing the information displayed in the Activity. 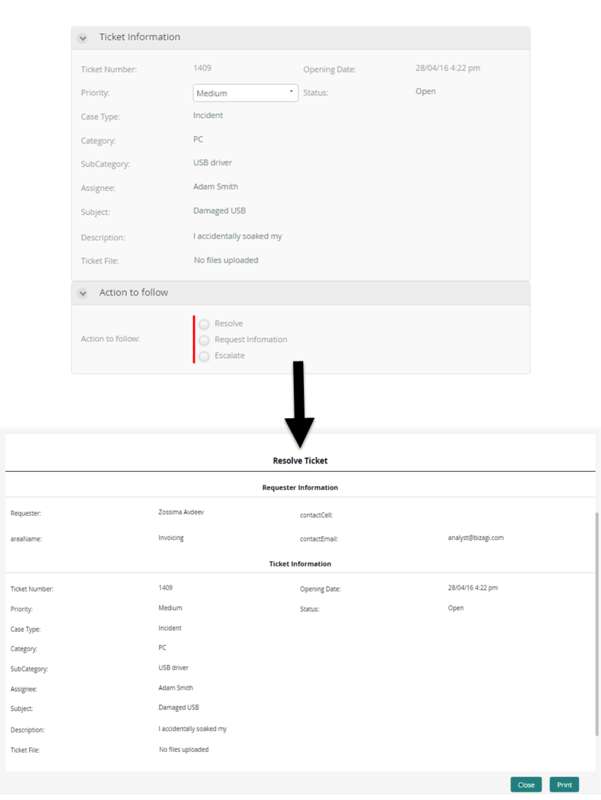 7.Activity Form: Allows you to view and enter the required information of the Case. 8.Action Buttons: Enables you to save the entered information and continue with the Case. 9.Graphical Query: Shows the status and development of the Case in a graphical way. 10.Process Help: Opens the configured help URL for the current Process. This icon does not appear if the URL has not been configured, refer to Process Properties for more information. 11.Process Details: Shows information about the current Process. 12.Activity Details: Shows information about the current Activity. 13.Assigned Users: Shows the assigned users to active Activities of the Case. 14.Activity Plan: Allows the creation of a new plan for the current Activity. Keep in mind that the sidebars are always collapsed by default on mobile displays. Also, by default, the right sidebar is collapsed on screens smaller than 1024 pixels. You can replicate this behavior for larger screens by selecting the option Always collapse activity sidebars in the User Options. The Activity Form is where end users work to accomplish the task allocated. 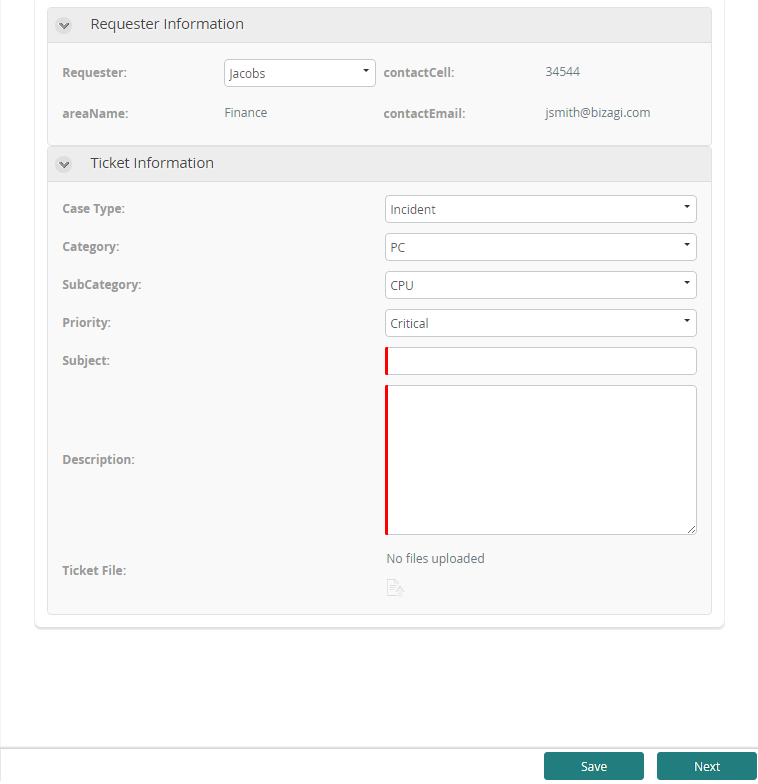 The User interface displayed corresponds to the Form defined in the third step of the Process wizard in Bizagi Studio for the current Activity. The allocated user need to fill-in all required information in order to finish the task. Required information will be denoted with a red line on the left. All fields marked with red must be filled-in in order to finish the activity. The information of the Activity can be grouped by using Containers controls (Tabs or Groups). This allows end users to have information visually order for them. 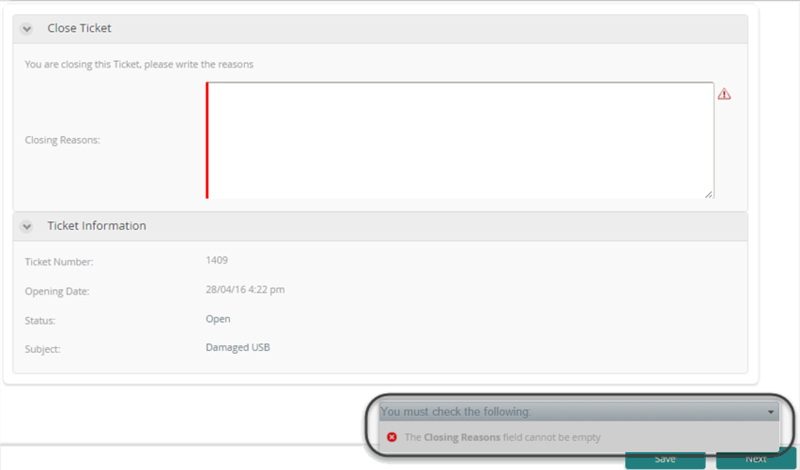 Mandatory fields will display a message whenever they are not completed and the end user clicks Next. 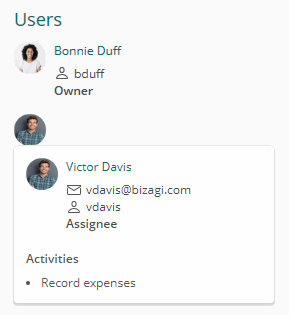 Other validations will display on the bottom right corner to inform end users of any validation for data integrity that has been defined in Bizagi Studio. Action buttons are the ones that allow end users to save an activity and to finish it, by default. •Save Button: This button is used to save the information that has been entered for the activity. It can also throw validations or execute business rules when created On Save of a Task. •Next Button: This button finishes and closes the current Activity moving the process forward in its flow. All Actions enabled in the activity will launch as soon as the button is clicked. This action cannot be undone. •Form Buttons: Additional buttons can be added to the Form, that are not enabled by Default. Form buttons are user defined buttons used to perform specific actions. For further information please refer to Form buttons. 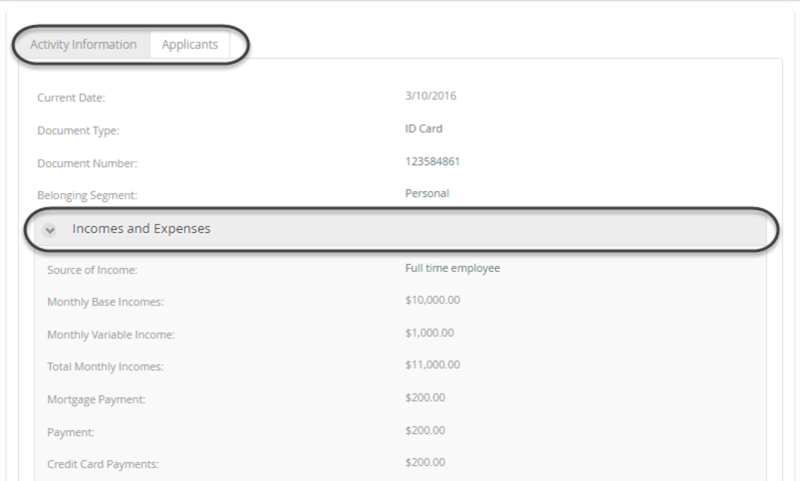 When selecting the Overview the Summary form defined for the Process will display. On the top of all allocated activities we find the Process path. 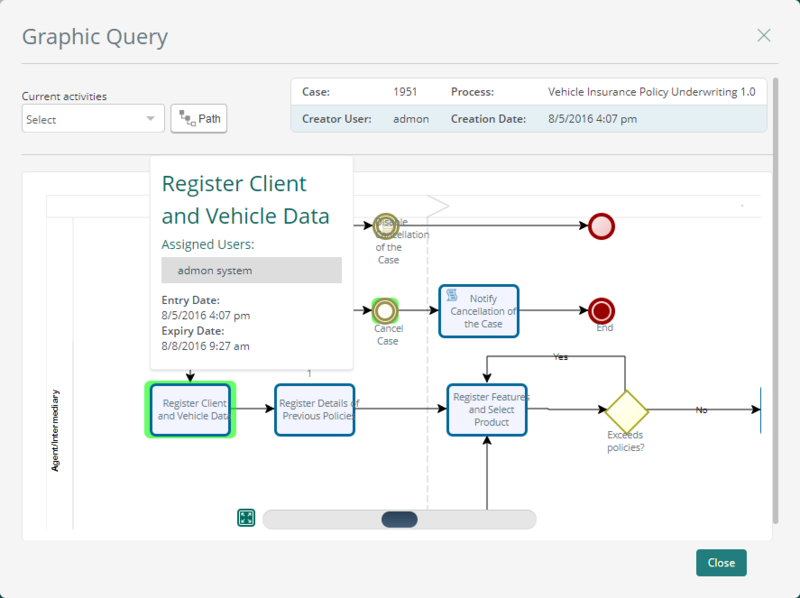 It includes the process' application, process' name and current activity name in order give the end user permanent visibility of the activity and process in which he/she is currently working on. This icon enables you to print the information shown in the current form. When you click the Print icon, a preview window will display. Click the Print button to print the document. The Graphic Query shows the path the process has followed in a graphical way, including the users involved and its status. In this section you can view the creation date of the current case as well as its status. This status is designated by the same color as the process time overall: a red, yellow or green bar on the left. The size of the bar varies depending on the time remaining to complete process on time. 1.Date when the Case was created. 2.Case state. It is given by the overall time configured for the process. 3.How much time the Case has been active. In this section you can view the creation date of the current Activity as well as the status of the Activity. Status are: a red, yellow or green bar on the left. The length of the bar varies depending on the time remaining to complete the activity on time. 2.The initial and due date of the Activity. 3.Activity state. Given by the configured time to perform the activity. 4.Time the Activity has been active. There is a list of all the users involved in the case. Each user icon displays their initials. When hovered a description per user is shown. When a user is allocated to an activity that belongs to a process, it might happen that he/she requires the help from other colleagues to complete it. Plans are also available within ongoing activities. Users can create Plans and get their colleagues. When you have not created a Plan for the current Activity, an Add Plan button is shown to allow creating a new Plan for the current Activity. Otherwise, a View Plan button is shown to open the Plan created. For further information please visit the Plans.